One of the important requirements that the AGS of an Independent Certified Gemologist Appraiser Form is that we cannot be involved in buying or selling of jewelry. Why is that important? Bias exists when profits are affected by appraisal outcomes. Too often in the trade, inflated appraisals are used as selling tools and don't really serve the purpose of serving the client. You pay high premiums on something you will never realize in case of loss, theft or damage. There are currently only ten labs in the United States with our qualifications. Do you know one does not need a license to appraise jewelry? In order to perform a competent and comprehensive appraisal it is mandatory to have the right tools, knowledge and experience. We maintain our lab to industry standards and are constantly upgrading our equipment. Our diamond master stones for color grading have been accepted and certified by the GIA and the AGS. We have to be re certified each year to maintain our membership and titles. 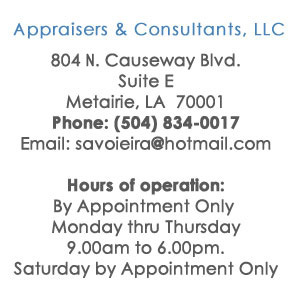 Savoie Fine Jewelry Appraisers & Consultants has been approved for AGS membership by and International Admissions Board of the AGS.